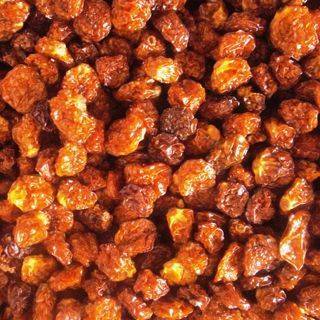 OrganicCrops is introducing dehydrated golden berries for worldwide export. Aguaymanto as they call the golden yellow fruit in Peru, are cultivated both organically and conventional in the Huanuco region of the Amazon rainforest. Golden berries are not a berry. The fruit is a close relative of the tomato family, specifically the tomatillo. When you slice a golden berry in half, the inside of the fruit resembles a tomato. When ripe, the outer shell is discarded and only the bright yellow-orange fruit is eaten or processed/dehydrated. They taste moderately bitter-sweet, with a slight citrus aftertaste. After harvest the fruit is filtered, washed and then dehydrated to preserve flavor and nutrients. Once dehydrated, golden berries look like a big golden brown raisin. Golden berries are high in Antioxidants and rich in nutrients such as bio-flavonoids, fiber, protein and vitamin A, C, E, K1, B1, B2, and B3. The fruit consist of 15 fatty acids and phytosterols. With 53 calories per 100 grams, golden berries are low in calories. More nutrient information here. You can eat them as a snack, mix them with cereal, use them in desserts or baked products such as muffins.